Almost any layout will include locations where roads cross tracks. This requires modeling a grade crossing (or else let your scale motorists bump over the rails). 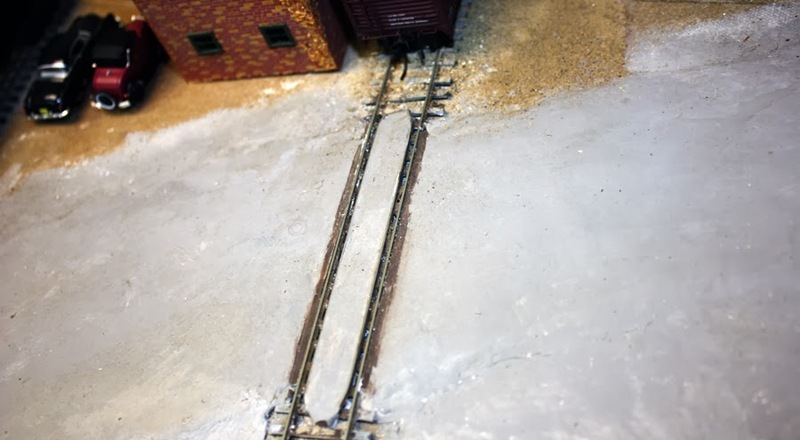 I have made three different kinds of grade crossings on my layout, and I will say a little about them in this post. Not knowing a great deal about the prototype situation for how grade crossings come about and are maintained, I asked well-known modeler Jack Burgess, retired from an engineer’s job with the City of Newark. Here is what I learned. In the prototype, grade crossing installations depend on the history. If a road exists prior to the railroad being built, the railroad has to both build and maintain the road crossing. But if a road is built after the railroad is in place, the city or county has to build it and also maintain it. The former case naturally results in great local frustration, because the railroad rarely cares as much about a smooth roadway as do the local citizenry, and it can be hard to get them to do maintenance. Now let’s look at modeling. To make a general observation regarding layout operation in relation to grade crossings, it is important to provide adequate clearance for the rolling stock. You should leave a wider flangeway than would be the case in the prototype, and of course to make sure that all parts of the crossing between the rails are lower than the rail height. (This is also helpful when cleaning track.) Of course, if you don’t observe these rules, operating a train through the crossing will generally bring them to your attention. One type I have modeled is the type made up entirely of wood planks. 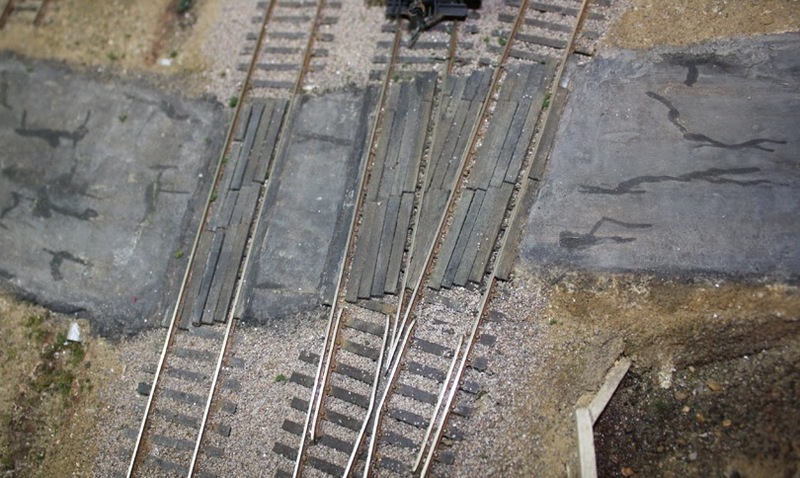 I used Model Hobbies wood ties (which are stained black), appropriately split to make them shallow, and fitted them into the spaces of a somewhat complex trackwork that is crossed. This is the crossing of Nipomo Road in my town of Ballard. There are tar repairs in some of the paving, and the split ties are weathered to look about like the road surface. At the bottom of the photo, you can just see the culvert where Cienega Creek comes under the tracks, and at left there is a drainage ditch culvert under the road. A second type, which I have seen a lot of places, is a mixture of paving and planks, with the (replaceable) planks at the edges alongside the rails. This is the crossing of Chamisal Road in my layout town of Shumala. Here again, I have tried to represent tar-repaired cracks, and also a certain amount of oil and grease dropping. A center line has been provided. That’s the depot parking lot at upper left, and just the very edge of the green depot roof is visible in the lower left corner. The third type, which I have seen occasionally, is all paving, with old rail used to contain the paving between the rails and keep the flangeway open. I would use the next smaller size of rail, compared to the track, for this application, such as Code 55 in Code 70 track. This is Bromela Road in my town of Ballard, in a view looking right over the depot roof. The roadway surface is plaster. The road will probably get a center line one of these days, and for my era, 1953, it will be white. The road obviously needs weathering too. The one thing missing at my crossings is protection, minimally in the form of crossbucks, or flashers at a busier crossing. The crossings shown above are all near the layout edge, meaning that an HO scale crossbuck would be pretty vulnerable. I did build one crossbuck when I was in Pittsburgh, using (oversize) square brass tubing for the post and soldering two strips of heavy brass sheet to the post for the crossbuck itself. All corners were real sharp. That sucker wasn’t vulnerable; it was your forearm that was vulnerable if you bumped into it! But it got lost in the move and so far hasn’t surfaced. I may get to making more of those. I enjoy building these crossings and have put some effort into getting them to look right. If you live at all near a railroad, you can drive over and look at a few crossings for yourself. You will certainly get some ideas of how they look, and how they get worn or damaged. 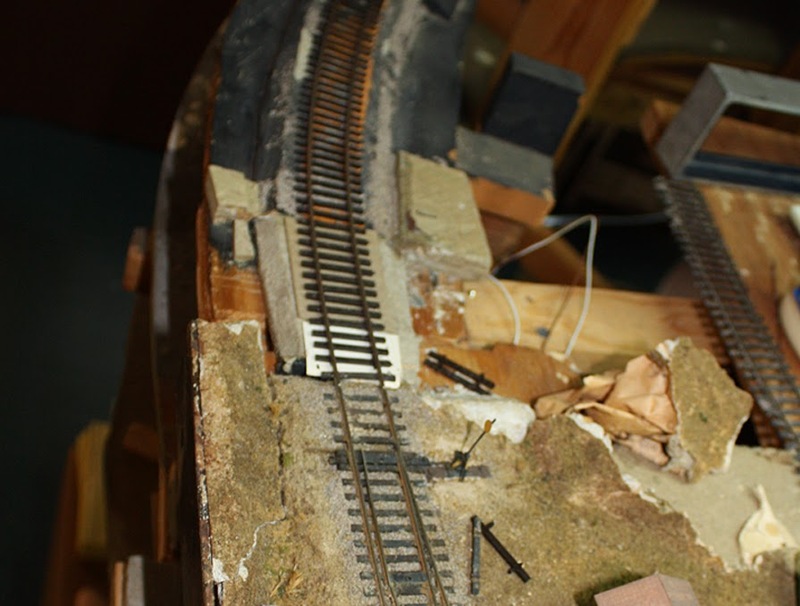 I was browsing some layout photos, taken awhile back, and in some areas was struck at the degree of change (progress!). In particular, with the repair of the Ballard hill (described in a series of posts, concluding with this one: http://modelingthesp.blogspot.com/2014/01/repairing-ballard-hill-conclusion.html ), the town connections are now radically changed for the better. Here is a photo taken facing toward the future location of the Ballard hill and the Ballard tunnel portal, looking railroad west (approximately geographical northeast). There is no sign of the hill or the tunnel, and the view is largely down into the layout supports. Another older view, in the opposite direction, railroad east or geographical southwest, shows a view from what would become the hillside above the tunnel portal (this and similar views are in my first post about the Ballard hill, at: http://modelingthesp.blogspot.com/2013/11/repairing-ballard-hill.html ). Here again, no sign of the hill or even of the fascia. A couple of structures are in their correct places, temporarily until other repairs can be made. Tools and materials litter the area. A more recent snapshot with about the same perspective shows the difference, from right above the tunnel portal. Nipomo Street crosses the tracks in the middle distance. I have for years taken “layout progress” photos from time to time, often simply walking around the layout and getting a snapshot of each area, both when I had my layout in Pittsburgh, and here in Berkeley. These can be very interesting to view in later times, and to me, this set of Ballard photos epitomizes that. In my first post on this topic, I presented the background of the Associated Oil Company through its history. That post can be found at this link: http://modelingthesp.blogspot.com/2013/12/associated-oil-company-background.html . 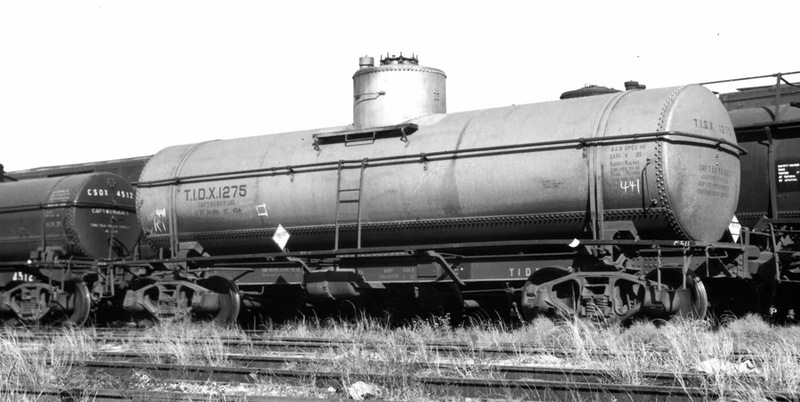 In the present post I provide more information about the tank cars of Associated (and of Tidewater Associated). Some of the history of Associated’s tank cars can be found in my book about SP tank cars, because of the exchange of cars between SP and Associated in the years 1906 through 1920. The book is Southern Pacific Freight Cars, Volume 5, Hoppers, Covered Hoppers, and Tank Cars, Signature Press, Berkeley and Wilton, CA, 2008, and I will just refer to it as “Volume 5.” Chapters 10 and 11 include mention of these SP–Associated connections, and also of interest might be the sidebar I wrote on “Early California Oil and Tank Cars,” pages 202 and 203 in Volume 5.
in 1902, American Car & Foundry built 40 tank cars of 9500-gallon capacity for Associated Oil, very similar though not identical to Santa Fe Class Tk-E tank cars being built at the same time. These cars are illustrated in Volume 5, pages 250 and 251, after their transfer to SP in 1906. The cars were numbered 101–179 (odd numbers only) while in Associated service. Whether these were cars purchased by SP and leased to Associated is not known, but they did come back to SP in 1906. That was the year that Associated received 300 cars of Common Standard design, Class O-50-2, a car of 12,500 gallons capacity. These 300 cars are interesting, because the original Harriman Lines order to Pressed Steel Car Company was for 725 cars (SP 50250–50974). Also ordered were 245 cars for the Union Pacific system. 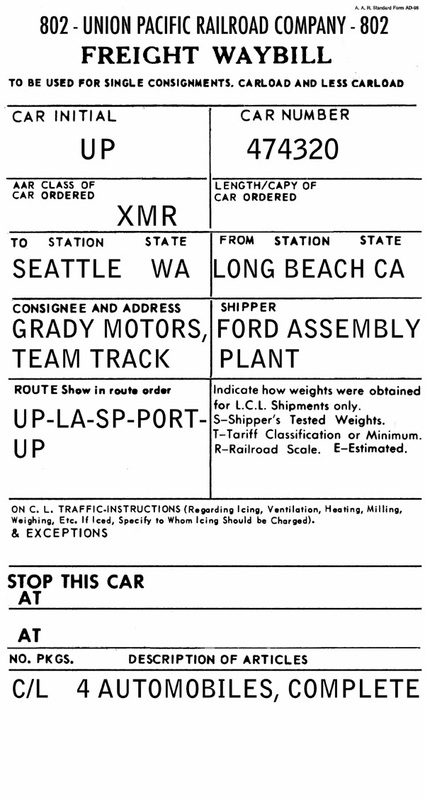 Within a few months the SP order was reduced to 625 cars by reducing the highest car number to SP 50874. But before these cars were placed in service, 300 were diverted to Associated, where they were numbered 153–452 (Associated also owned some 40 cars of 8000-gallon capacity at that time). Presumably Associated purchased these 300 cars from SP. The SP cars which Associated got were drawn from various part of the SP number series, leaving several gaps in car numbering which are very obvious in SP car ledgers. Here is a photo of a Class O-50-2 car, from the 1913 SP valuation photography series. It is not quite in original condition, as the diagonal tank hold-downs from each end have been removed. This SP photo is from the Jeff Root collection, and the written legend was made on the negative. Associated Oil does not appear in the Official Railway Equipment Register or ORER until 1911, so these cars can’t be traced prior to that year, except through some SP records. And as late as January 1920, Associated still rostered 340 cars, the same 300 cars of 12,500-gallon capacity just described, and the 40 cars of 8000-gallon capacity. The latter group, numbered 113-152, evidently includes car AOX 147, shown in the previous post (cited at the top of this page). But after the return of 75 of the O-50-2 cars to SP in 1920, and disposal of others, the Associated fleet decreased in size, to 255 cars in 1925, and to nearer 100 cars in the late 1920s. And incidentally in 1920, Tidal Gasoline of Tulsa, Oklahoma, using the reporting mark TIDX, rostered 60 cars, most of them of 8000-gallon size. By 1925, these TIDX numbers had grown to 550 cars. By 1930, Associated only listed 85 cars in the ORER, 75 of them being 8000-gallon cars and only 10 of the old 12,500-gallon cars. By that time, Tidal Gasoline had become Tidal Refining and the TIDX listing comprised 1284 cars, almost 200 of which were leased cars. About this time appeared the first listings under the TWOX reporting mark, identified as Tidewater Oil Sales Company, 319 cars. In 1935, AOX’s fleet remained about the same as in 1930, but TIDX had decreased to 949 cars and TWOX listed 521 cars. Of course, by this time all three entities had been controlled by the Tide Water Associated Oil holding company for ten years. That was first reflected in the ORER in July 1937, when all three reporting marks were gathered under Tidewater Associated Oil Company (the full merger had taken place on November 30, 1936). Like every photo I have ever seen of a TIDX car, the one above has an aluminum-painted tank and very plain lettering. In earlier days, they used one-inch stripes above and below the reporting mark and car number, but obviously that was discontinued by the time this General American car was photographed. This George Sisk photo was taken at Kansas City about 1954, is from the Charles Winters collection, and is used with permission. In 1953, the year I model, the total Tidewater Associated fleet was 1249 cars, without indication of exactly how many in each component reporting mark; but it does appear that around a third of the cars were AOX cars. And Associated still showed two of the Class O-50-2 cars in its roster! In the previous post (cited at the top of the present post), I showed a photo of an Associated car taken in 1955. Here is another photo, taken by Wilbur C. Whittaker in the 1940s, showing an older lettering style. This is an 8000-gallon car. 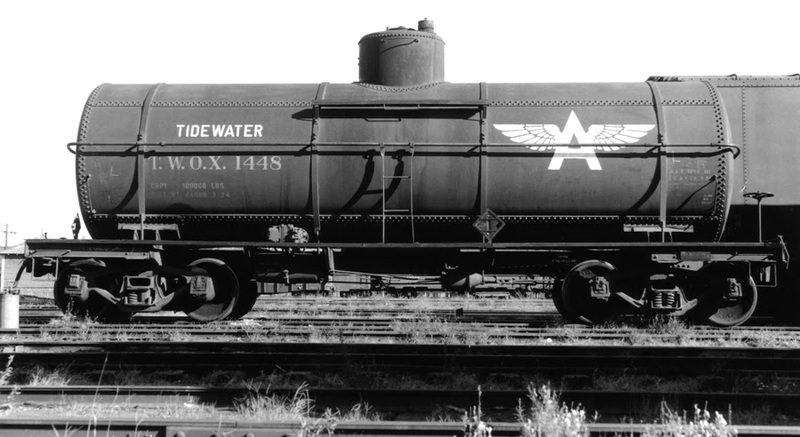 The addition of the word “Tidewater” to the company’s tank cars appears to have taken place in the mid to late 1950s. This vivid example, an AC&F car photographed by Chet McCoid in Providence, Rhode Island on October 11, 1957, clearly shows the much cleaner white of the word “Tidewater” and of the Flying A emblem. The photo is from the Bob’s Photo collection and is used with permission. These images do suggest some modeling needs, for both General American and AC&F tank cars, and for decals to letter them. I am working on artwork to do just that. With the layout surface cleaned up and made ready for viewing, the aisles also cleared out for visitors, and the black drapes attached below the layout fascia, the Shumala side of the layout looked like this. Walking around to the other side of the peninsula to Ballard, this view could be seen, again with the black drapes in place. These are simply attached with Velcro strips to the underside of the fascia — which is one reason to maintain a consistent height of the bottom of the fascia! The staging table, so far without its own fascia, is visible underneath the track board for Ballard. The description I prepared mostly contains material already available in various posts on this blog, though scattered among a number of posts. The main such post is the one about my choice of layout locale, which can be found at: http://modelingthesp.blogspot.com/2011/01/layout-design-locale.html . Here is the description text as it was handed out. 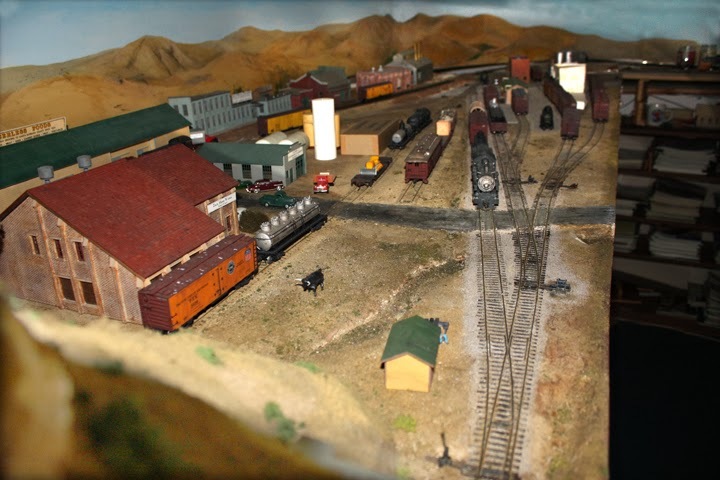 A little history: between 1980 and 1994, I built a 16 x 19-foot layout in Pittsburgh, PA, representing San Luis Obispo and environs on Southern Pacific’s Coast Line. It was set in 1953, the last year that SP still operated a predominance of steam in coastal California. After Mary and I moved to Berkeley in 1994, we first lived in a house without a good space for a layout. 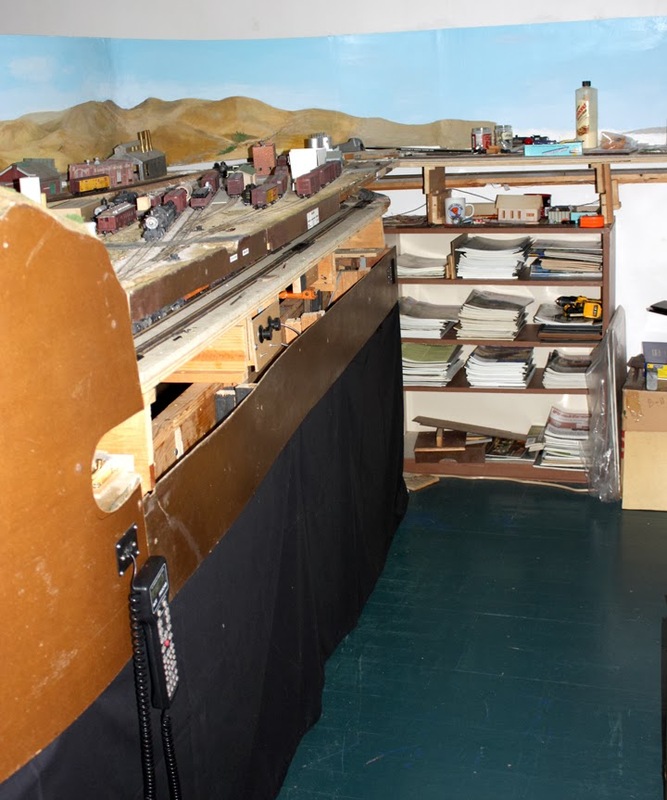 But when we moved to our present house, I was finally able to get going on a layout again in 2009. I used parts of the old layout, along with some new construction, to build the present one. I chose NCE as my control system. The layout represents a mythical branch line, leaving the Coast Line in the Central Coast area between San Luis Obispo and Santa Maria. The branch is imagined to serve the agricultural production of the area north of Santa Maria, largely field vegetables, with some tree fruit. Town names are chosen as a selection of the kinds of names often encountered in this area of California: Shumala (Chumash Indian), Santa Rosalia (Spanish) and Ballard (American settlers). The junction with the main line is at Shumala, while the branch ends at Santa Rosalia, which thus becomes the name of the branch. This area contains two familiar California plant communities, oak woodland (which means a lot of golden grass), and coastal sage. Some effort has gone into trying to represent these communities realistically, particularly on the backdrops. In addition to the agricultural products shipped from packing houses, some light manufacturing is also included, along with traditional small-town businesses like bulk oil dealers, wholesale grocers, and a California Division of Highways garage. 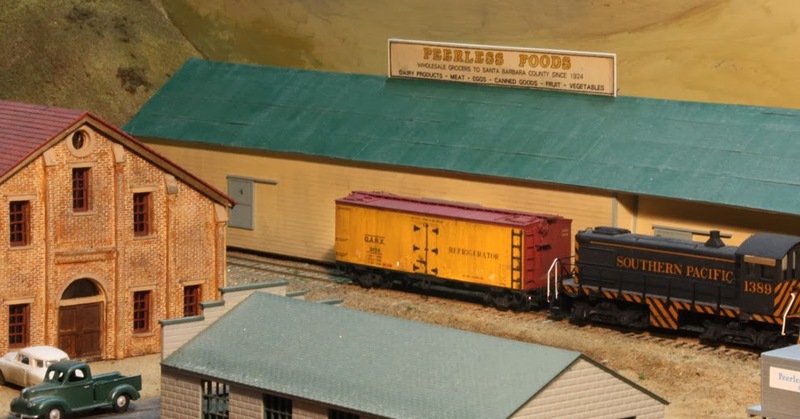 The SP roundhouse at the Shumala junction receives shipments of fuel and shop parts, and the perishable shipments require an ice deck to pre-ice or initial ice refrigerator cars. A special interest of mine is freight cars, not only of the SP but of North American railroads generally, so extensive effort has been devoted to assembling a fleet of appropriate and accurate freight cars. Of course SP and Pacific Fruit Express are major components, but so are other western railroads, such as Santa Fe, UP, and Western Pacific. The branch itself is “dark territory,” meaning that it is unsignaled, and because the track plan includes only a short segment of the Coast main line, schedules are not very important. Nevertheless, a timetable has been developed, including train descriptions and relevant special instructions for the guidance of crews. The mainline trains which are through freights can be simply run as a line-up. And of course the Coast Line main does host the Daylight and Lark trains, along with the “Coast Mail” and the “Overnight.” Together, the Guadalupe local and the Surf turn provide the vital interchange function for the branch. Both those trains originate at and return to San Luis Obispo, north of Shumala. Through freights are powered by cab-forwards, 2-10-2s, and F-unit diesels. Local freights mostly use Consolidations and Ten-wheelers. 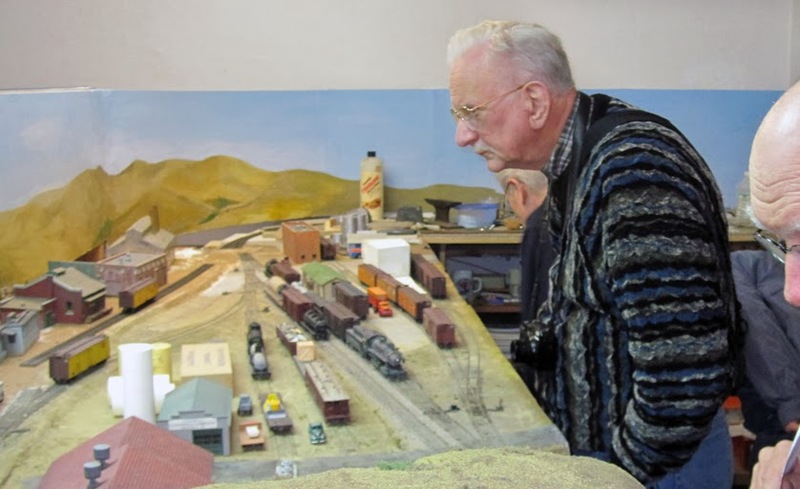 The largest amount of switching on the layout is at Ballard, the track arrangement for which is modified from Terry Walsh’s “West Agony & Inchoate” layout, published in Model Railroader in July 1960. The other two towns have simpler track arrangements. The main line staging is accomplished in a “transfer table” arrangement underneath Ballard, where 12 staging tracks permit ample train selection. My interest in prototypical waybills for model use has resulted in development of a system which has been working well on this layout. Crews receive a handful of waybills when they begin work at Shumala, and would collect additional ones from the agent at Ballard when they arrive there to switch. A bill box at each depot is used instead of pockets for waybills on the fascia. Scenery and structure building are still in progress in some areas, but I hope completion of those features is not too far off. The trains and the waybills can hardly wait. There are quite a few previous posts about the topic of waybills in this blog (you can find them by using the search box at upper right on this page, and using the word “waybills” or other search terms of your choice). As I point out from time to time, Mike White in Maryland has collected my first 26 posts into a single document, and it’s available in Waybill Post 27 (which can be found at: http://modelingthesp.blogspot.com/2013/02/waybills-27-collected-posts.html ). The present post is occasioned by several recent conversations I have had with fellow modelers, and also by some experiments I’ve conducted on my own layout. I came to realize that there is, one might say, a creative tension between two different approaches to modeling waybills. I want to say a little about them both in this post. There is a long-traditional method, usually called “car cards and waybills,” in which something representing the car, and something representing waybill information but without car identification, are combined. The history of these goes back to Doug Smith in 1961, and on current layouts is usually the “mini” version from Old Line Graphics or Micro-Mark. This can be simplified and simultaneously made much more prototypical, using the Bill Neale idea of baseball-card sleeves; I described that approach in an article in Railroad Model Craftsman in December 2009. The three lines of car information at the bottom are on the sleeve, not on the waybill paperwork behind it. 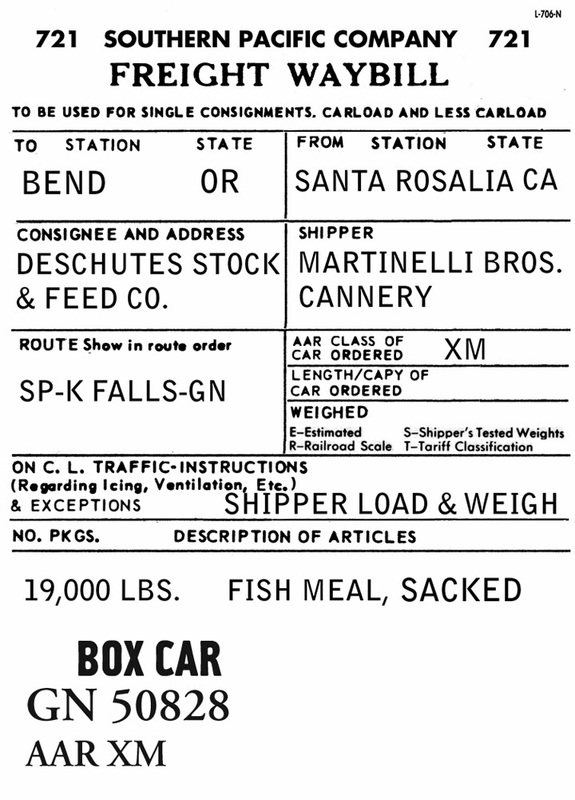 This approach, whether using Old Line Graphics four-cycle bills or these sleeves with prototypical paperwork in them, can be regarded as “traffic-centric,” because the traffic needs of the railroad dictate the loads and empties which are moved — and not the cars which handle the traffic, in most cases. The load paperwork is matched up to the sleeve, representing the car, much like the prototype does it. And in staging a session with this approach, you select loads to move, not cars which already have assigned loads. The size is 2 x 4 inches, matching the Old Line Graphics four-cycle car cards. 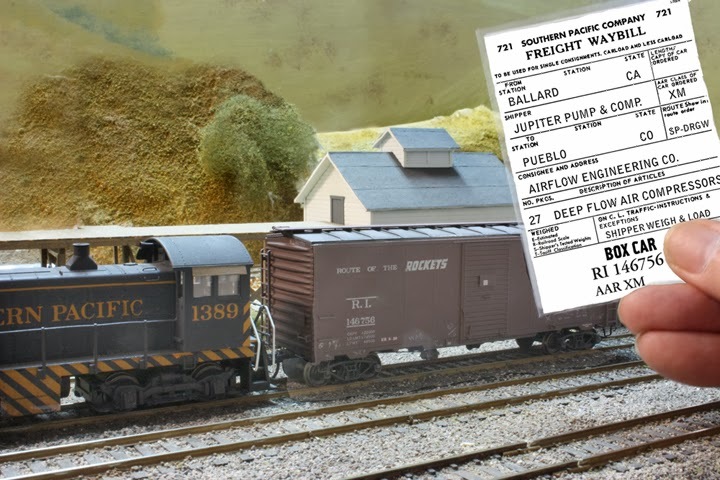 Note that this load now moves only in one specific box car, unless multiple copies of this waybill are made, each with a different car initial and number on it. That’s why I think you can regard this system as “car-centric,” because the focus is on individual cars and what they may carry. When you re-stage this paperwork, each waybill assigned to this car is a pre-selected movement. The “car-centricity” of this approach can be reduced by using the idea of a “master bill,” having only a header with car initials and number, and then a series of “load bills” which can be inserted in front of the lower part of the master. (I discussed this use of a modified “short bill” in a prior post, at: http://modelingthesp.blogspot.com/2011/08/waybills-11.html .) But this only works for cars which get loaded at industries which are on-line and thus always have the same originating railroad name in their waybill header. For other free-running loads which can originate anywhere around the country, thus originating on a wide range of railroads, this modification accomplishes little. My own view is that if you model a bridge line or any situation in which large numbers of cars are moved across the layout in an operating session, it makes good sense to use a car-centric waybill method. If you model a switching layout, or any small layout in which modest numbers of cars are moved, a traffic-centric method may work better. My own layout is small and switching-oriented, and despite trying the simple waybills of a car-centric approach, I have found that the traffic-centric bills work better for me. Does this mean that the new approaches are not yielding a “universal method?” Maybe so. But with ideas still emerging and new strategies still being explored, it is probably too soon to be sure of such a conclusion. Some of the recent ideas about both of these approaches were described in one of Tony Koester’s “Trains of Thought” columns, entitled “In search of the perfect waybill,” in Model Railroader for February 2012 (page 82), and Ted Pamperin’s excellent article in that same issue of Model Railroader (page 45) further refines the car-centric waybill. If you’re interested in this topic and haven’t read one or both of these articles, I strongly recommend that you do so. And whether you choose car-centric or traffic-centric methods, there is genuine realism nowadays in how both methods are being used. Among the iconic images of the Southern Pacific in the steam-diesel transition era were freight trains powered by Electro-Motive F units. This is a complex subject on both the prototype and model sides, and I will only touch on a few aspects in this and following posts. My plan is to present my own modeling choices and approach to these locomotives. Nowadays it seems to have faded from memory, but Southern Pacific, together with subsidiaries Cotton Belt and T&NO, owned by far the largest American fleet of F7 locomotives, 573 all told. And even their fleet of F3 locomotives, 180 in total, made them third in North America behind UP and Southern. The year that I model, 1953, was chosen because it was the last year that steam power was more prevalent on the Coast Line than diesels, but it also needs to be remembered as a time of relatively few diesel roadswitchers on SP, and an awful lot of F units. That’s why it is essential for me to model them. I’ll begin with resources for information. 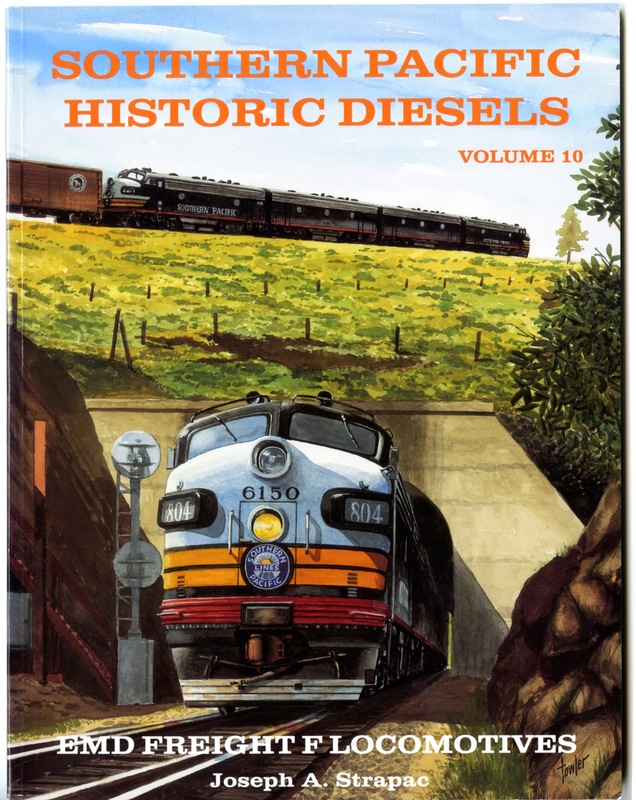 First, I should mention the “bible” on prototype SP units, Joe Strapac’s superb volume in his Southern Pacific Historic Diesels series, Volume 10, “EMD Freight F Locomotives” [Joseph A. Strapac, Shade Tree Books, Bellflower, CA, 2003]. If you are serious about understanding the SP prototype F units, this is indispensable, so if you don’t have a copy, you need to get one. Here is the cover, featuring a fine painting by Ernie Towler. For those who have a set of the SP Historical & Technical Society magazine, Trainline, Joe also wrote an article which kind of previewed the book, in Trainline issue 66 (Winter 2001). As that article is necessarily briefer and far less fully illustrated than Volume 10, I might otherwise not mention it, except that Trainline 66 also contains an F-unit modeling summary, written by me (pages 25 to 29). By the way, this and other back issues of Trainline are available from the Society. For this one, go to: http://www.sphtsstore.org/servlet/the-Trainline-back-issues/s/65/Categories . The summary attempted to include all the details essential to accurate modeling, and to reflect the various time frames for those details. A core part of the piece was a graphic by John Signor, showing the approximate time span for various details of the locomotives, such as nose grab irons, diaphragms, multi-chime horns, etc. The only drawback to this modeling summary is that the list of model parts, and some of the paint listings, are pretty old and not too helpful today. For a painting guide I recommend the SPH&TS volume, SP Painting and Lettering Guide, by Jeffrey Alan Cauthen and John R. Signor, SPH&TS, Upland, CA, 2013. It can be purchased direct from the Society on line. What I will discuss, with these publications as background, is my own choices for modeling SP F units. Partly because my trains on the main line aren’t very long (a limitation of my staging tracks), I will use the common arrangement of F units on the SP Coast Line, an A-B formation. The question then is, to choose particular A and B units, and that is what I will discuss in the next post on this topic. For more than three years now, Rapido Trains has had an announcement “on the table,” for 37-foot General American meat refrigerator cars in HO scale. Moreover, I alluded to that announcement in a post to this blog almost exactly three years ago, when I was describing the start of my project to create some of my own meat refrigerator cars from the old LifeLike models (at: http://modelingthesp.blogspot.com/2011/02/modeling-meat-reefers.html ). And as it happened, contrary to the long-standing hobby rule that as soon as you put a lot of time into any project, it will be introduced in commercial form, neatly eclipsing your efforts, I did get my own meat car models done and into service last spring, long before the Rapido cars arrived (as you can see at: http://modelingthesp.blogspot.com/2013/05/modeling-meat-reefers-part-5.html ). I most recently mentioned the Rapido cars in my comments about the 2014 meeting in Cocoa Beach, Florida, that some of the cars had actually shown up as door prizes at the meeting (you can read it at: http://modelingthesp.blogspot.com/2014/01/cocoa-beach-2014-part-2.html ). Long ago, I reserved three Rapido cars at my nearest serious hobby shop, Just Trains in Concord, California, and now the cars have arrived. They really look great! and were certainly worth waiting for. But they did need a little work. The couplers are imitations of Kadee No. 5 couplers, produced by Rapido’s Chinese factory, and though most of the ones I got work all right, one was very stiff and did not improve by repeated flexing. I replaced both couplers on that car with Kadee No. 58, and will probably replace the others eventually. Trucks look good but do have Code 110 wheels, thus are candidates for wheel replacement, though I have not yet done so. 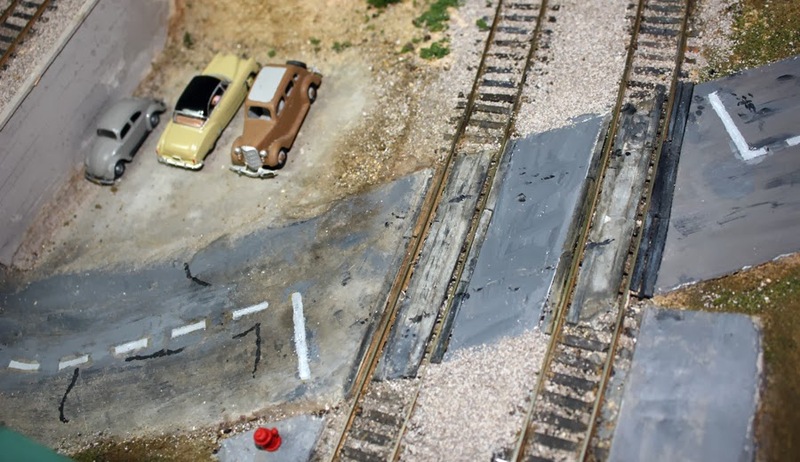 I added reweigh dates correct for my layout, and lightly weathered the cars. I will just show one of them, GARX 3494, a car I particularly like because it is not one of the “billboard” paint schemes, but represents a plain, workaday leased car. This is the kind of car that does not jump out at you in a passing train — I already have too many cars of that kind, and am trying to keep them under control! The car is being spotted at Peerless Foods in my layout town of Ballard. Incidentally, the Peerless delivery truck is visible at lower right. You can click on the photo to enlarge it. Part of the fun of operation for me is this kind of detail in spotting cars, which is entirely prototypical. If you would like to know more about my approach(es) to model waybills, I would recommend the summary post which is at: http://modelingthesp.blogspot.com/2013/02/waybills-27-collected-posts.html . A previous post reported completing the main roundhouse structure, including all roof sections. Most of the work followed kit directions. That post is at: http://modelingthesp.blogspot.com/2014/01/a-roundhouse-for-shumala-part-4.html . At this time, then, I set out to build the chimneys for the structure. Up to this point, I had been impressed with how well everything in the kit fit together, and assembly had gone really well. The chimneys do not exactly fit that description. They are keyed so the sides can only be assembled in one orientation, which is fine, but the tabs on the square interior former are simply too large in any orientation. (And believe me, I tried many permutations and combinations of the assembly before realizing I had more work to do.) Tedious filing and fitting was needed to get these components together. Once together, and with minor filing of the roof openings, they do fit into place nicely. The kit directions say that these chimneys were white, but the one color view I have shows more of a light gray, which is the color I painted mine. Here is a roof view to show how they look. 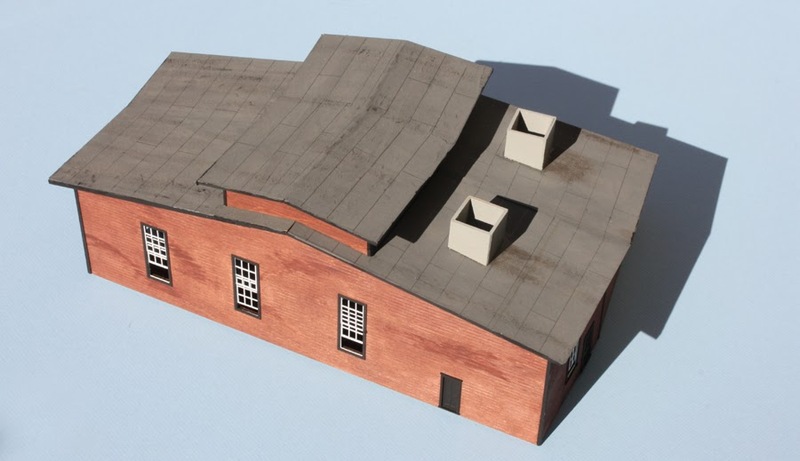 You can see that I have drybrushed the roof to accomplish some weathering. 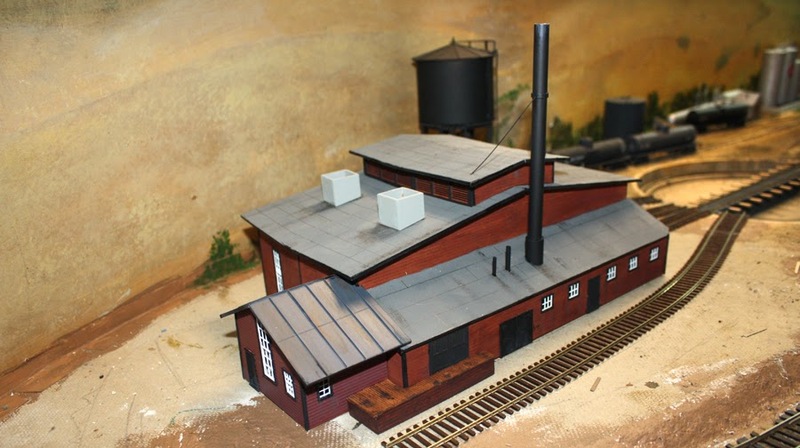 The final part of the project is the smoke stack for the boiler house. My first reaction was that the stack is pretty tall, although photos of the prototype for the kit, Port Costa roundhouse, do show a stack like this. I then looked at boiler house photos from several places on the SP system, including San Luis Obispo, and all had stacks roughly twice the height of the boiler house below — which is just about how the height of the kit stack measures up. So I went ahead and built it as provided in the kit. I decided to drill all the way through the stack, and use a single piece of brass wire to represent the guy wires on both sides. This worked fine. Once I had a little weathering on the stack, the project was complete. I will repeat what I have said in several places: this is an outstanding kit, which goes together well, has excellent instructions which include suggestions how to do things you might not be familiar with, and is very faithful to the prototype. I would recommend it to anyone beyond a total beginner. Installation on the layout is shown in the photo below. Ballasting and some detail work on the surroundings remains to be done, along with a coal pile for the boiler house, but it’s nice to see the structure in its location. Tracks were wired some time ago, and I verified that engines can run freely in and out of the house. This view shows Ten-wheeler 2344 almost entirely inside the house (it will fit all the way in, if desired). 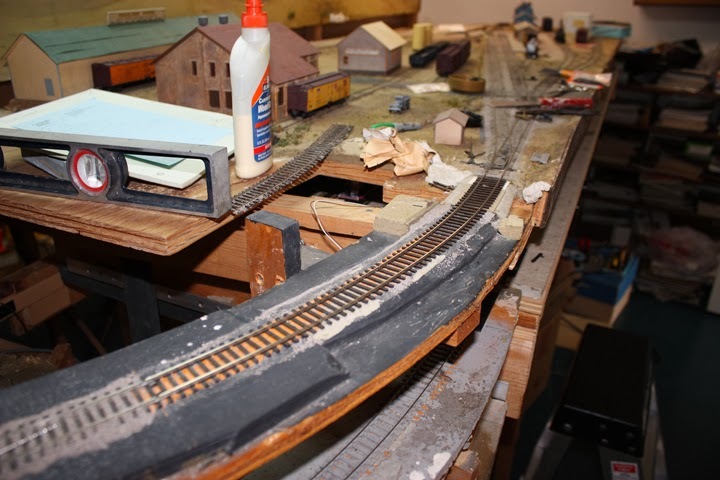 The foreground track, serving the shop, remains to be weathered. 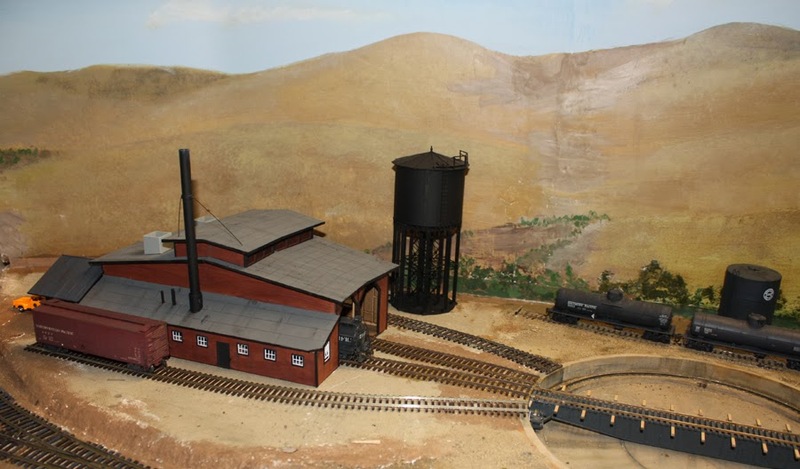 In the background is a Precision Scale brass Harriman water tank, the water supply for the water column on the outbound engine track. Also at right are some SP tank cars, delivering locomotive fuel. From an angle to the rear of the structure, the loading dock and machine shop are readily visible, once the box car in the view above is removed. Again, the area around the building remains to be scenicked. This roundhouse is the centerpiece of my Shumala engine terminal, and applying scenery around it will complete it. The only thing then remaining to add to the engine terminal is a sand house, which is on my near-term “to do” list. Every year for quite a few years (at least 25), a meeting called the “Bay Area Layout Design & Operations Weekend” has been put on in January, often the weekend before the Super Bowl. It’s organized by the Layout Design SIG (Special Interest Group) and the Operations SIG of NMRA, under the auspices of the Pacific Coast Region (PCR) of NMRA. You can read about it on the PCR website, at: http://pcrnmra.org/sigs/ . Last fall, layout tour organizer David Parks asked me if I would be open for this year’s layout tours. Gulping a bit, I agreed. I was well aware I had a whole bunch of layout projects in midstream, and ideally would finish at least a few of them before the open house, or at least get them to a presentable state. But naturally I felt some pressure to do a lot of projects. I know well from my days in the world of work that deadlines can be your friend — sometimes it’s amazing how much you can accomplish under pressure. But suffering under a self-imposed deadline can feel like one of those things you should have been smart enough to avoid. Of course, that’s what one always realizes in hindsight. Anyway, I made a “to do” list that seemed like it was realistic, and set to work. Long story short, I actually did finish nearly all the things I originally listed, even though I knew some were a stretch. Repairing the ocean beach (see the post at: http://modelingthesp.blogspot.com/2013/11/rebuilding-my-ocean-beach.html ) was one of them; another was the Ballard hill (see: http://modelingthesp.blogspot.com/2014/01/repairing-ballard-hill-conclusion.html ). Yet another was building enough of my new section (Santa Rosalia) so that I could complete all backdrop painting, including repairs where new sections were joined to older ones. That project only got partly completed; the latest report on how far I had progressed was at: http://modelingthesp.blogspot.com/2014/01/constructing-santa-rosalia-backdrop_29.html . Still, I did meet my main goal, to get that backdrop far enough along so that it would be presentable. But finally the big day came: Saturday, January 25. The layout tour list listed me and ten others. It was a self-guided tour, set for the evening hours, 7–10 PM. We put out some cookies and waited to see what would develop. I have on some previous occasions had my layout open for self-guided tours and had only a half-dozen visitors. But that was not what happened this time! I would estimate about 50 people visited during the three hours. 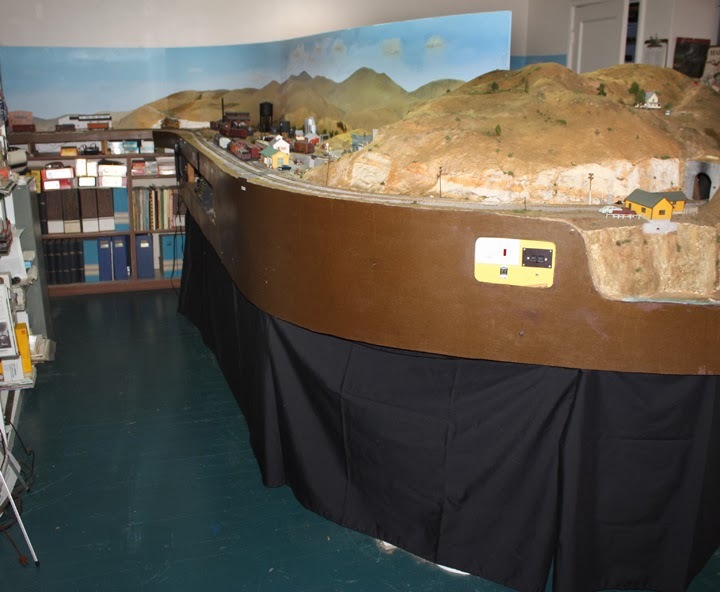 There were often 6 to 8 people in the room at a time, and all seemed to enjoy visiting and viewing the layout. Cookies had to be replenished. Tangerines were a cookie backup; they were consumed also. Photographs were taken. And a pleasant roar of conversation was the order of most of the evening. I asked my wife to take a few snapshots. Of course many turned out to show mostly the backs of heads, but here are a couple of interesting ones. 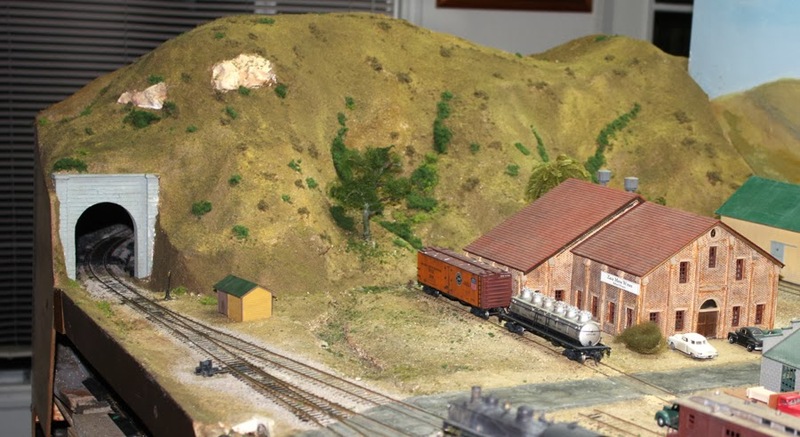 At left in this view of the Shumala side of the layout is Seth Neumann, chair of the weekend’s meeting. At center is Pete Cressman, and at right is my next-door neighbor, Joel Kaufman, who was helping out by running trains while I talked to guests. And on the Ballard side, at photo center is David Parks, who organized the tours and originally invited me to be open for this event. I prepared and handed out a one-page layout description, to provide some background for visitors. This proved especially timely, since Mr. Parks forgot to distribute the brief descriptions he had previously requested from layout hosts! But that didn’t really matter, since what I wrote was more extensive than what I sent to David. I will either post this description to Google Drive or perhaps simply include it in a future post. In addition to the pleasure of moving several projects forward in preparing for the open house, I had the fun of showing off the layout in its present state to a fair bunch of people. Well worth any small headaches along the way.